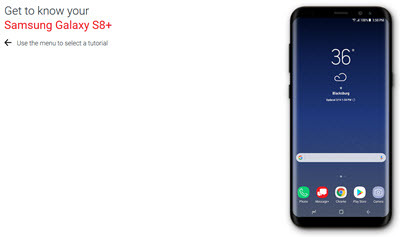 Conoce tu nuevo Samsung Galaxy S8 / S8+ con esta guía de consulta rápida. Esta guía del usuario del Samsung Galaxy S8 / S8+ puede ayudarte a aprovechar al máximo tu dispositivo, como funciones de la pantalla de inicio, soluciones rápidas, widgets, íconos de la barra de estado, panel de notificaciones, sugerencias de navegación, configuración del dispositivo y uso avanzado. Here's how to perform initial activation and setup on the Galaxy S8 / S8+. Here's how to turn on Android Device Protection for your Samsung Galaxy S8 / S8+. Aprende a configurar tu nuevo Samsung Galaxy S8/S8+ con funciones importantes. Aprovecha al máximo tu nuevo teléfono con esta lista de sugerencias prácticas. To transfer/move/upload music files between your device and your computer/PC or removable memory/SD card, view this info. Para transferir, mover o cargar archivos de fotos o videos entre tu dispositivo y tu PC o tarjeta de memoria SD extraíble, consulta esta información. Video: Transfer content from your phone easily by using Smart Switch on your Samsung Galaxy S8 / S8+. Video: Use your Galaxy S8 / S8+ like a personal computer by connecting it to the DeX Station. Video: Dropped your phone in water? Here are some tips on how to properly clean your phone. Here's info on the battery specs (e.g., Usage Time, Standby Time, etc.) for your Galaxy S8 / S8+. Here's how to improve the battery life for your Galaxy S8 / S8+. Here's how to configure power saver settings for your Galaxy S8 / S8+. Video: Have no fear! You can use your old charger on your new Samsung Galaxy S8 / S8+ by using the micro USB connector. Here's how to make your Galaxy S8 / S8+ visible to Bluetooth devices. Here's how to send a contact via Bluetooth on your Galaxy S8 / S8+. Here's how to turn Bluetooth for your Galaxy S8 / S8+ on or off. Here's how to configure speed dial number on your Samsung Galaxy S8 / S8+. Aquí te mostramos cómo enviar llamadas no deseadas directamente al buzón de voz en tu Galaxy S8/S8+. Here's how to call a number with your Samsung Galaxy S8 / S8+. Here's how to place a conference call on your Galaxy S8 / S8+. Here's how to call the last number you dialed on your Galaxy S8 / S8+. Here's how to add a speed dial to your Galaxy S8 / S8+. When turned on, Wi-Fi Calling may improve indoor call quality for your Galaxy S8 / S8+. Here's how to view or clear the call history on your Samsung Galaxy S8 / S8+. Una guía interactiva sobre cómo llamar a un contacto con tu Samsung Galaxy S8. Descubre cómo usar tu Samsung Galaxy S8 para llamar a un nuevo número. Discover how to make a call in HD Voice on your Samsung Galaxy S8. Learn how to make a call with video in HD Voice on your Samsung Galaxy S8. Una guía visual para ignorar una llamada y enviar un mensaje de texto a la persona que llama con tu Samsung Galaxy S8. Una guía visual sobre cómo retomar una llamada después de hacer otras tareas, como navegar por Internet en tu Samsung Galaxy S8. Aprende cómo alternar entre dos llamadas telefónicas en tu Samsung Galaxy S8. Aprende cómo enseñarles a los niños a llamar al 911 en tu Samsung Galaxy S8. Descubre cómo activar voz HD en tu Samsung Galaxy S8. Learn how to use Wi-Fi Calling on your Samsung Galaxy S8. Descubre cómo usar tu voz para hacer una llamada con tu Samsung Galaxy S8. Descubre cómo ver una llamada perdida y agregarla como contacto nuevo en tu Samsung Galaxy S8. Video: Send your friends funny, personal Gifs and learn to create them on your Galaxy S8 / S8+. Here's info on common camera settings (e.g., flash, HDR, etc.) for your Galaxy S8 / S8+. Here's how to record and share a video on your Galaxy S8 / S8+. Here's how to share a picture from the gallery on your Galaxy S8 / S8+. Here's how to share a video the gallery on your Galaxy S8 / S8+. Here's how to take and share a picture on your Galaxy S8 / S8+. Here's how to share your screen or media files with another screen (TV, game console, etc.) using your Galaxy S8 / S8+. Here's how to view pictures / videos on your Galaxy S8 / S8+. Mira cómo acceder a la aplicación de la cámara con rapidez en tu Samsung Galaxy S8. Aprende cómo tomar una foto de la pantalla y verla en tu Samsung Galaxy S8. Conoce cómo cambiar el tamaño de archivo de fotos o videos en tu Samsung Galaxy S8. Aprende a grabar un video usando tu Samsung Galaxy S8. Una guía visual sobre cómo compartir fotos por email, redes sociales y más con tu Samsung Galaxy S8. Aprende cómo tomar una foto con tu Samsung Galaxy S8. Discover how to take a picture while recording a video on your Samsung Galaxy S8. Una guía interactiva sobre cómo tomar una selfie con tu Samsung Galaxy S8. Learn how to free up memory on your phone by moving photos to your SD card using your Samsung Galaxy S8. Una guía visual para conocer cómo tomar fotos con flash con tu Samsung Galaxy S8. Aprende cómo acercar o alejar el zoom cuando tomas fotos con tu Samsung Galaxy S8. If you can't transfer media between your Galaxy S8 / S8+ and PC, view this info. Video: Set up and access your 10 favorite contacts easily by setting up People edge on your Galaxy S8 / S8+. Here's how to add a contact on your Galaxy S8 / S8+. Here's how to configure how you want your contacts to display on your Galaxy S8 / S8+. Here's how to delete contacts on your Galaxy S8 / S8+. Here's how to edit saved contacts on your Samsung Galaxy S8 / S8+. Aprende cómo agregar un nuevo contacto en tu Samsung Galaxy S8. Descubre cómo agregar o borrar contactos de tu lista de favoritos en tu Samsung Galaxy S8. Descubre cómo agregar una foto a un contacto de tu Samsung Galaxy S8. Aprende cómo asignar un timbre a un contacto para saber quién te envía mensajes sin mirar tu Samsung Galaxy S8. Discover how to block and unblock a number on your Samsung Galaxy S8. Una guía visual sobre cómo crear un grupo de contactos en tu Samsung Galaxy S8. Aprende cómo compartir información de uno de tus contactos con alguien más usando tu Samsung Galaxy S8. If you can't connect to the internet or send or receive email / messages on your Galaxy S8 / S8+, view this. Here's how to change the data usage cycle, view data usage and set data warnings and/or limits on your Galaxy S8 / S8+. Here's how to restrict the amount of data an app uses on your Galaxy S8 / S8+. Here's how to turn the mobile data for your S8 / S8+ on or off. If your Galaxy S8 / S8+ shows the incorrect date and/or time, view this info to correct it. Here's how to find the device ID (ESN / IMEI / MEID) for your Galaxy S8 / S8+. Here's how to view the Wi-Fi MAC address for your S8 / S8+. Here's how to view the phone info (Bluetooth address, serial number, etc.) on the Galaxy S8 / S8+. Here's how to view the mobile number for Samsung Galaxy S8 / S8+. Here's how to adjust the brightness on your Samsung Galaxy S8 / S8+. Here's how to adjust the display settings on your Samsung Galaxy S8 / S8+. Here's how to adjust the font settings on your Samsung Galaxy S8 / S8+. If your Samsung Galaxy S8 / S8+ crashes, resets or runs slow, or apps freeze or reset the device, view this. Here's how to turn download booster for your Galaxy S8 / S8+ on or off. Here's how to turn Emergency Mode on or off on your Galaxy S8 / S8+. Here's how to reverse the color scheme on your Galaxy S8 / S8+. Si la pantalla de tu Galaxy S8 / S8 edge no gira, te mostramos cómo solucionarlo. Descubre cómo acceder a las configuraciones de tu Samsung Galaxy S8 para cambiar los sonidos de alerta, desactivar el GPS y más. Una guía visual sobre cómo prolongar la duración de la batería de tu Samsung Galaxy S8 al configurar el tiempo que la pantalla permanece encendida. Find out how to change roaming settings on your Samsung Galaxy S8. Aprende cómo cambiar el timbre en tu Samsung Galaxy S8. Aprende cómo administrar las configuraciones de ubicación en tu Samsung Galaxy S8. Aprende cómo administrar el uso de data en tu Samsung Galaxy S8. Conoce cómo silenciar tu Samsung Galaxy S8. Una guía interactiva para configurar tu Samsung Galaxy S8 en modo Airplane. Learn how to update the OS on your Samsung Galaxy S8. Aprende a cambiar el modo de ahorro de energía para prolongar la duración de la batería de tu Samsung Galaxy S8 para las funciones más importantes. Here's how to add a personal email account to your Samsung Galaxy S8 / S8+. Here's how to add an existing Google account to your Samsung Galaxy S8 / S8+. Here's how to create a New Google account on your Samsung Galaxy S8 / S8+. Here's how to delete email messages from your Galaxy S8 / S8+. Here's info on common personal email settings (e.g., account name, etc.) for your Galaxy S8 / S8+. Here's how to modify data usage options for the personal email account on your Galaxy S8 / S8+. If you're not getting notifications for the personal email on your Galaxy S8 / S8+, view this info. Here's how to update the personal email password/server settings for your Galaxy S8 / S8+. Here's how to enter or edit the personal email signature on your Galaxy S8 / S8+. To adjust the personal email sync frequency settings on your Galaxy S8 / S8+, view this info. Here's info on updating work email server settings for your Galaxy S8 / S8+. Here's how to sync your Google email, contacts, calendar, etc. on your Samsung Galaxy S8 / S8+. Removing then re-adding a work email account on your Galaxy S8 / S8+ often fixes email issues. Removing then re-adding a Gmail account on your Galaxy S8 / S8+ often fixes email issues. Removing then re-adding an email account on your Galaxy S8 / S8+ often fixes email issues. Here's how to reply to an email message from your Galaxy S8 / S8+. Here's how to add a work email account on your Galaxy S8 / S8+. Here's how to view email messages on your Galaxy S8 / S8+. Aprende cómo reenviar un correo electrónico en tu Samsung Galaxy S8. Aprende cómo adjuntar un archivo, como un documento o una foto, a un email con tu Samsung Galaxy S8. Descubre cómo responder un email con tu Samsung Galaxy S8. Una guía visual paso a paso para enviar un email con tu Samsung Galaxy S8. Find out how to send an email to a group on your Samsung Galaxy S8. Aprende cómo acceder al email laboral en tu Samsung Galaxy S8. Mira cómo acceder a tu cuenta de email actual en tu Samsung Galaxy S8. Mira cómo acceder a diferentes cuentas de email en tu Samsung Galaxy S8. Here's how to turn GPS location on or off for your Galaxy S8 / S8+. Video: Control and customize what appears on your edge panel so you can reach your favorite tools in a single swipe! Video: Learn to use the edge Infinity screen and customize your edge panel with all of your favorite apps. Here's how to add Home screen panels to your Galaxy S8 / S8+. Here's how to add shortcuts to the Home on your Galaxy S8 / S8+. Here's how to add a Home screen widget on your Galaxy S8 / S8+. Here's how to change the Home screen settings for your Galaxy S8 / S8+. If the screen on your Galaxy S8 / S8+ looks different, here's how to return it to its original setting. Here's how to remove Home screen panels on your Galaxy S8 / S8+. Here's how to remove items from the Home screen on your Galaxy S8 / S8+. Here's how to rename a Home screen folder on your Galaxy S8 / S8+. Here's how to set the default Home screen panel on your Galaxy S8 / S8+. Here's how to view Home screen panels on your Galaxy S8 / S8+. Una guía interactiva sobre cómo colocar aplicaciones y widgets en la pantalla de inicio de tu Samsung Galaxy S8 para acceder rápidamente a ellos. Learn how to add emergency information on your Samsung Galaxy S8. Aprende cómo agregar carpetas a la pantalla de inicio de tu Samsung Galaxy S8 para organizar tus aplicaciones. Find out how to add shortcuts to the lock screen on your Samsung Galaxy S8. Mira cómo agregar y borrar pantallas de inicio en tu Samsung Galaxy S8. Aprende cómo reorganizar y cambiar el tamaño de aplicaciones y widgets de la pantalla de inicio de tu Samsung Galaxy S8. Una guía visual para cambiar la pantalla de inicio predeterminada de tu Samsung Galaxy S8. Mira cómo eliminar aplicaciones y widgets de la página de inicio de tu Samsung Galaxy S8. Aprende a usar soluciones rápidas para desbloquear la pantalla de tu Samsung Galaxy S8. Here's how to change the Mobile Hotspot password on your Galaxy S8 / S8+. Here's how to check settings if you're having issues connecting to the Mobile Hotspot on your Galaxy S8 / S8+. Here's how to configure Mobile / Wi-Fi Hotspot Settings (e.g., password, allowed devices, etc.) for your Galaxy S8 / S8+. Here's how to turn Mobile Hotspot on/off on your Galaxy S8 / S8+ or if you can't connect to Wi-Fi. Here's how to add a Virtual Private Network on your Galaxy S8 / S8+. To change the browser Home page on your Samsung Galaxy S8 / S8+, see these steps. Here's how to open the Chrome web browser on your Galaxy S8 / S8+. Aprende cómo marcar un sitio web como favorito en tu Samsung Galaxy S 8, para luego encontrarlo fácilmente. Descubre cómo encontrar un sitio web con tu Samsung Galaxy S8. Explora cómo buscar en internet con tu voz usando tu Samsung Galaxy S8. Un recorrido visual sobre cómo abrir, cerrar y cambiar entre ventanas o pestañas en el navegador de internet de tu Samsung Galaxy S8. Here's how to change the display language on your Galaxy S8 / S8+. Descubre cómo cambiar la configuración de idioma en tu Samsung Galaxy S8. Video: Add some extra privacy and security to your phone by learning to encrypt your SD card on your Galaxy S8 / S8+. Video: Never forget a password again by setting up Facial Recognition for maximum security! Video: Add extra privacy and security to your phone by learning how to secure your folders on your Galaxy S8 / S8+. Here's how to add additional fingerprints on your Samsung Galaxy S8 / S8+. Here's how to adjust the screen lock settings for your Galaxy S8 / S8+. Here's how to remove saved fingerprints on your Galaxy S8 / S8+. Here's how to set up facial recognition to unlock your Samsung Galaxy S8 / S8+. Here's how to set up fingerprint lock for your Galaxy S8 / S8+. Here's how to set up a screen lock on your Galaxy S8 / S8+. Here's how to turn on and customize the Smart Lock setting on your Galaxy S8 / S8+. Here's how to disable the screen lock setting on your S8 / S8+. To unlock the screen on your Samsung Galaxy S8 / S8+, check out this info. Mira cómo desbloquear la pantalla de tu Samsung Galaxy S8. Video: Keep your phone secure and protected by learning how to set up Iris Security. Here's how to check the available storage space on your Galaxy S8 / S8+. View this info on memory card formatting options for your Galaxy S8 / S8+. Here's how to remove an SD (Memory) Card on your Galaxy S8 / S8+. Una guía interactiva para configurar tu Samsung Galaxy S8 como un hotspot móvil para poder compartir tu conexión de data con otros dispositivos. Mira cómo cambiar y cerrar aplicaciones que se están ejecutando fácilmente en tu Samsung Galaxy S8. Una guía visual sobre cómo desplazarte entre varias pantallas de inicio en tu Samsung Galaxy S8. Discover how to use split screen mode on your Samsung Galaxy S8. Descubre cómo acceder a y borrar el panel de notificaciones de tu Samsung Galaxy S8. Here's how to set up your Galaxy S8 ? S8+ to pay for items just by touching your phone to a reader at a checkout register. To wirelessly transfer data from your Galaxy S8 / S8 plus to another NFC-capable device, view this. Here's how to transfer data via S Beam on your Galaxy S8 / S8+. Así puedes activar o desactivar Android Beam con tu Galaxy S8 / S8+. Here's how to turn NFC (Near Field Communications) for your Galaxy S8 / S8+ on or off. If your Galaxy S8 / S8+ has a blank or frozen screen or calling, app, audio and syncing issues, view this. Here's how to check for or to install software updates on your Galaxy S8 / S8+. Here's how to view the software version your Galaxy S8 / S8+ is running. Video: Learn to remove the SIM and SD cards on your Samsung Galaxy S8 / S8+ with the ejector tool. Here's how to remove the SIM card on your Galaxy S8 / S8+. Here's how to turn SIM lock on or off for your S8 / S8+. If the SIM PIN for your Galaxy S8 / S8+ is blocked, here's how to unblock it. Here's how to view SIM card number on the Galaxy S8 / S8+. Descubre cómo acceder a tu cuenta de Facebook en tu Samsung Galaxy S8. Aprende a salir de Facebook en tu Samsung Galaxy S8 para proteger tu cuenta. Un recorrido visual sobre cómo actualizar tu estado de Facebook y publicar fotos con tu Samsung Galaxy S8. Here's how to save a ringtone on your Galaxy S8 / S8+. Here's how to set ringtones on your Galaxy S8 / S8+. To utilize the speakerphone functionality on your Galaxy S8 / S8+, view this info. Here's how to turn off all sounds for your Galaxy S8 / S8+. Here's how to turn vibrate mode on or off for your Galaxy S8 / S8+. Find out how to access settings in Easy mode on your Samsung Galaxy S8. Descubre cómo acceder y borrar el panel de notificaciones mientras estás en Easy Mode en tu Samsung Galaxy S8. Descubre cómo configurar la pantalla de aplicaciones favoritas en modo Easy en tu Samsung Galaxy S8. Aprende cómo configurar la pantalla de contactos favoritos en Easy Mode en tu Samsung Galaxy S8. Descubre cómo realizar una llamada en Easy Mode en tu Samsung Galaxy S8. Una guía visual acerca de cómo navegar por varias pantallas de inicio en Easy Mode en tu Samsung Galaxy S8. Aprende cómo volver al modo Standard desde el modo Easy en tu Samsung Galaxy S8. Mira cómo cambiar a Easy Mode para ver pantallas de inicio simplificadas en tu Samsung Galaxy S8. Here's how to view the signal strength on your Galaxy S8 / S8+. Here's how to create and send a text message on your Galaxy S8 / S8+ via the Messages app. To Cut, Copy and Paste Text on your Samsung Galaxy S8 / S8+, view this info. Here's how to delete text messages from your Samsung Galaxy S8 / S8+. Here's how to manage text (SMS) messaging notification settings on your Galaxy S8 / S8+. Here's how to receive delivery confirmation for messages sent from your Galaxy S8 / S8+. Here's how to change permissions to allow or block sending premium texts from your Galaxy S8 / S8+. Here's how to view text messages via the Messages app on your Galaxy S8 / S8+. Video: Turn on the blue light filter to dim your Galaxy S8 / S8+ and make night time scrolling easier. Video: Use Pin to Top to keep whatever you choose to select at the top of every screen you browse. Video: Learn to take a screen shot with the new Infinity screen on your Galaxy S8 / S8+. Here's how to capture a screenshot on your Samsung Galaxy S8 / S8+. Here's how to set up printing from your Galaxy S8 / S8+. Find out how to add S Health trackers on your Samsung Galaxy S8. Discover how to customize S Health on your Samsung Galaxy S8. Descubre cómo encontrar videos y tutoriales para obtener más información sobre cómo usar tu Samsung Galaxy S8. Descubre cómo medir el nivel de oxígeno en la sangre con tu Samsung Galaxy S8. Learn to set up your S Health Profile on your Samsung Galaxy S8. See how to add track your heart heart on your Samsung Galaxy S8. Here's how to change the TTY settings on your Samsung Galaxy S8 / S8+. Here's how to set a wallpaper on your Galaxy S8 / S8+. Aprende cómo cambiar el tema en tu Samsung Galaxy S8. Aprende cómo cambiar el fondo de la pantalla de inicio en tu Samsung Galaxy S8. Here's how to use Wi-Fi Direct so you can easily connect your Galaxy S8 / S8+ with other Wi-Fi capable devices. Here's how to add a Wi-Fi Network on your Samsung Galaxy S8 / S8+. Here's how to allow your Galaxy S8 / S8+ to auto switch between Wi-Fi and mobile data. View this info if the Wi-Fi network you want to add to your Galaxy S8 / S8+ doesn't display. Here's how too remove a saved Wi-Fi network from your Galaxy S8 / S8+. Here's how to set up a tethered connection via USB or Bluetooth for your Galaxy S8 / S8+. Here's how to turn multi-window on or off for your Samsung Galaxy S8 / S8+. Aprende cómo usar tu Samsung Galaxy S8 para conectarte a una red Wi-Fi para poder acceder a Internet sin usar tus datos.